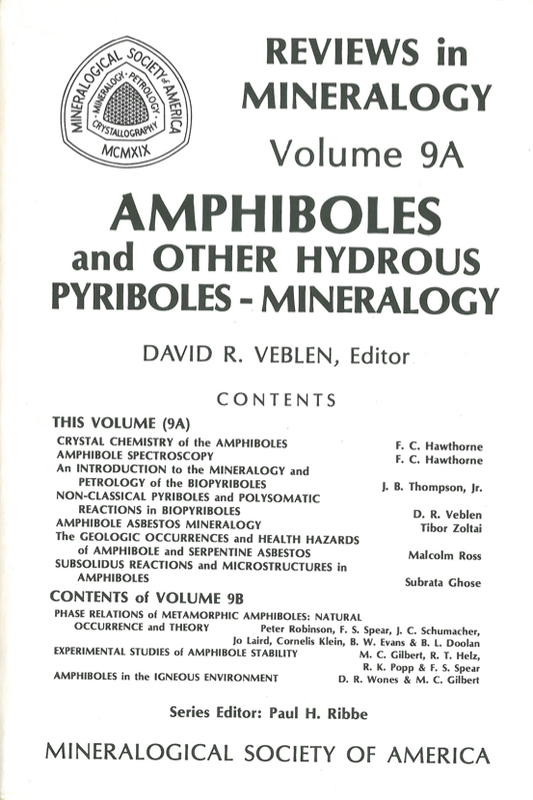 This volume of was prepared in conjunction with the Mineralogical Society of America Short Course on Amphiboles and Other Hydrous Pyriboles, Fall, 1981. Had it not been split into two volumes, 9A and 9B, it would have resembled in some respects the Manhattan telephone directory (it is hoped, however, that the content is more readable and relevant to the geological sciences). The length of this collection of papers appears to result from a combination of phenomena. The amphiboles themselves must accept most of the blame: their structural complexity and resulting chemical variability and diversity of petrologic behavior preclude brief description. In addition, while some of these papers are relatively brief summaries of the published literature that easily and quickly can be consumed by students, others are exhaustive (and lengthy) discourses that may not be digestible in one sitting by even the most dedicated amphibole researcher. Finally, it appears that some geologists, probably with justification, love amphiboles so much that they would never have stopped writing had there been no publication deadline. The extremely short time between the preparation of papers and publication of Reviews in Mineralogy and the authors' intimate knowledge of their fields ensure that the papers reflect the very latest in research results. The rapid production of the "Reviews," however, inevitably results in a few errors that might be caught in a more leisurely publication process; the editors apologize for any such errors that are included in this volume. In addition, the sequence of presentation of papers reflects not only the editors' notions of order in the amphibole universe, but also somewhat the order in which papers were received. Although a collection of reviews of this sort cannot claim to give exhaustive coverage to all aspects of a topic, it is hoped that the papers presented here do review most of the important areas of active amphibole research. The papers have been split in a somewhat arbitrary fashion into Volume 9A, Amphiboles and Other Hydrous Pyriboles - Mineralogy, and Volume 9B, Amphiboles: Petrology and Experimental Phase Relations. Everyone is encouraged to purchase both volumes, however, because there is a hefty dose of petrology in 9A (witness the paper by Thompson, for example) and not a little mineralogy in 9B.